New York, NY. 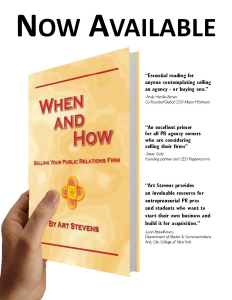 November, 2015 – “When and How – Selling Your Public Relations Firm” by Art Stevens is now available. Mr. Stevens is managing partner of The Stevens Group and formerly the founder and CEO of LobsenzStevens, a top twenty independent public relations firm.